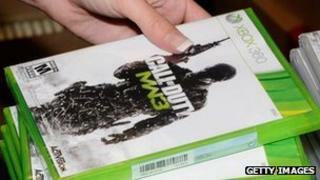 Sales of computer games in the UK have surpassed those of videos for the first time, new figures suggest. The Entertainment Retailers Association (ERA) said sales of £1.93bn in 2011 made the gaming industry the country's biggest entertainment sector. By contrast, sales of DVDs and other video formats totalled £1.80bn, while music pulled in £1.07bn. However, the games industry has had a bumpy start to 2012, withhigh street chain Game facing administration. Major publishers such as Electronic Arts had refused to do business with the retailer over concerns surrounding its financial future. In the first 11 weeks of this year, the ERA said video sales were worth more than two times those of games. By comparison over the whole of last year games accounted for 40.2% of the entertainment market, video for 37.6% and music for 22.2%. Total sales in 2011 for games, video and music fell year-on-year by 3.3% to £4.80bn. "This is a dramatic time for the entertainment market," said Kim Bayley, director general of the ERA. "It is an historic development for the games sector to have overtaken video last year. Video has long been the biggest entertainment sector. Sales so far this year, however, suggest video is not going down without a fight." Piers Harding-Rolls, head of games at IHS Screen Digest, backed up this view - suggesting that Game's struggles would see figures across the industry dip, if only for the start of the year. "If Game Group is significantly downsized as a chain, or if its trading continues to be limited in anyway, it is likely that there will be some knock-on impact on the sales potential for the UK market considering its size and reach as a chain," he told the BBC. "Catalogue sales look the most exposed, but I expect the impact to be temporary as the other specialist chains, independents and the numerous other retailers, both high street and online, take up any slack left in the market. "The UK is the most competitive retail games market in Europe - as such I don't believe gaps in the market will be left unplugged for any length of time."